Burma's pro-democracy leader Aung San Suu Kyi has left hospital and returned home under effective house arrest in the capital Rangoon, reports say. Ms Suu Kyi, who was recovering from a gynaecological operation in a private Rangoon medical centre, was discharged on Friday. A government spokesman quoted by Reuters news agency did not clarify the conditions of Suu Kyi's return to her home after more than three months in detention. "She will continue to rest at home under the supervision of her doctors while the government stands ready to provide and assist her with medical and humanitarian needs," the spokesman said. But anyone wanting to visit her will need to apply to the military government for permission, and her doctor said earlier on Friday she would be in custody at her home. The BBC's Burma analyst, Larry Jagan, says the ruling military junta is using her operation as a excuse to allow her home without appearing to back down to foreign pressure. Earlier, Ms Suu Kyi's physician stood outside the Asia Royal Hospital in Rangoon to announce that his patient was due to go home "but will still be effectively under house arrest". "Anybody who wishes to see her once she is home can make arrangement through the authorities," said Dr Tin Myo Win. Aung San Suu Kyi was detained on 30 May, following violent clashes between her supporters and a government-backed mob. Despite international outrage and Western sanctions, the Nobel prize winner has remained in detention ever since. Dr Tin Myo Win read out a statement by Ms Suu Kyi in which she thanked her supporters, who have maintained a vigil outside the medical centre, but asked "specifically that nobody should want to see me leave the hospital." The physician said he would accompany the pro-democracy leader to her lakeside residence outside Rangoon on Friday, and then visit her regularly. "I'm still worried about her health, but she is improving and she is perfectly well to go home," he said. 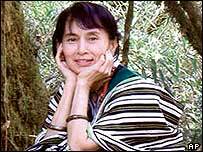 Aung San Suu Kyi, aged 58, has been under house arrest twice before - the first time for six years between 1989 and 1995, and the second time for 20 months until she was freed in May 2002. There has been a massive international outcry over her continued detention, with constant demands for her immediate and unconditional release. Her imprisonment has also strained relations within the region. Friday's development came after the Indonesian envoy to Burma, Ali Alatas, and the Thai foreign minister visited Rangoon earlier this week. Indonesia has been keen for Rangoon to make concessions before next month's Asean (Association of Southeast Asian Nations) summit in Bali, which Burma is due to attend. By allowing Aung San Suu Kyi to return home - albeit under house arrest - the junta may assume it has done just that. But according to our correspondent, international pressure will not stop until the Burmese Government unconditionally frees Aung San Suu Kyi, and starts substantive political talks with her about the future of the country. "Her release may give the military a chance to save face"